The much-talked about rocky royal relationship between Prince William and beauty Kate Middleton may be on again! The two were seen kissing at a party at William’s army barracks, according to reports, and Wills has also invited Kate, 25, to the upcoming Concert for Diana tribute. 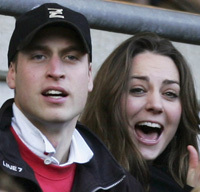 The couple split in April after five years together, shocking fans and eager Brits who were hoping for a royal wedding. A spokesman for Will, 25, won’t comment on the Prince’s personal life, so fans will just have to wait and see!